Math squares are an engaging, self-correcting activity for students that offer multiple entry and exit points. - Use them as a daily Math warm-up activity. - Use Math Squares to consolidate calculator skills. 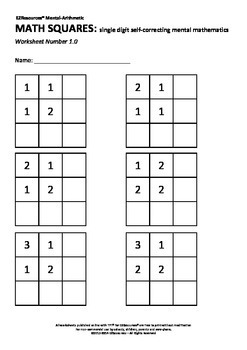 - Use as a center activity during Math centers. with multiple entry points you can give differentiated sheets in order to ensure that each student is working at the appropriate level. - Use as an Early Finisher activity. Please view the free preview for an explanation of how Math Squares work.